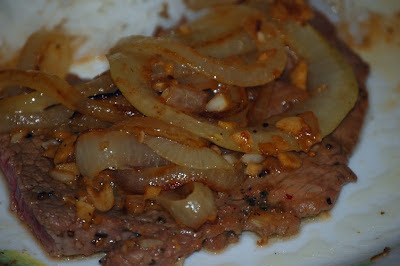 My first experience with Bistec is when I was in the Philippines and my mother in law made Bistek Tagalog. Although the Filipinos lay claim to it, Bistec is really an Spanish dish. Essentially just sirloin steak pounded flat and marinaded then pan fried until browned it's the ultimate tasty treat. This recipe for Bistec started when someone stuck a menu for a new Cuban restaurant in my front door. It's wildly expensive so I have no real intentions to go try it out however it fanned the flames of interest in Cuban Cuisine. It's Florida after all and we have such a Cuban community here but I never really entertained a Cuban dinner before now. The real recipe here is for the marinade. Cubans call it Mojito Sauce but the rest of Caribbean calls is Mojo. The real difference is the absence of hot peppers to be found in the rest of the Caribbean Mojo recipes. Cuban cuisine was very popular from the late 30's up until the Cuban Revolution although I don't know how many Americans outside of the Cuban community in Florida would have been familiar with it. *Valencia orange juice or best is blood orange juice. If you can't find either one then sour some regular orange juice with 1T lime juice. **Fried Plantains can be found in your grocer's freezer section. Forget using the fresh ones they are garbage quality and not ripe.